TITLE "The Perlman Edition - Tradition"
TITLE "As Der Rebbe Elimelech Is Gevoyrn Asoi Freylach"
TITLE "Oif'n Pripetchik Brennt A Feier'l"
TITLE "Oif'n Weyg Steyt A Boim"
TITLE "Vi Ahin Soll Ich Geyn"
TITLE "The Perlman Edition - Encores"
TITLE "Ottokar Novacek - Perpetuum Mobile Op. 5 No. 4"
TITLE "Paul Ben Haim - Berceuse Sfaradite"
TITLE "Claude Debussy - La Fille Aux Cheveux De Lin"
TITLE "Pablo De Sarasate - Zapateado Op. 23 No. 2"
TITLE "Manuel Ponce - Estrellita"
TITLE "Moritz Moszkowski - Guitarre Op. 45 No. 23"
TITLE "Fryderyk Chopin - Nocturne In E Flat Op. 55 No. 24"
TITLE "Francis Poulenc - Presto In B Flat"
TITLE "Camille Saint-Saens - The Swan From The Carnival Of The Animals"
TITLE "Domenico Paradies - Toccata"
TITLE "Edward Elgar - La Capricieuse Op. 17"
TITLE "Stephen Foster - Old Folks At Home"
TITLE "Henri Vieuxtemps - Souvenir D'Amerique On 'Yankee Doodle' Op. 17"
TITLE "Maria Theresia Von Paradis - Sicilienne For Keyboard In E Flat"
TITLE "Joseph Joachim Raff - Cavatina Op. 85 No. 3"
TITLE "Pablo De Sarasate - Malaguena Op. 21 No. 1"
TITLE "Pablo De Sarasate - Caprice Basque Op. 24"
TITLE "Pablo De Sarasate - Romanza Andaluza Op. 22 No. 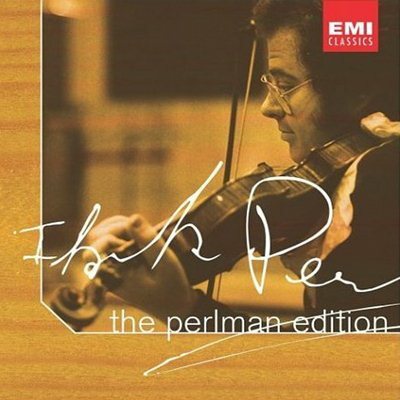 1"
TITLE "The Perlman Edition - J. S. Bach"
TITLE "Violin Concerto No. 2 In E Major BWV 1042 - I. Allegro"
TITLE "Violin Concerto No. 2 In E Major BWV 1042 - II. Adagio"
TITLE "Violin Concerto No. 2 In E Major BWV 1042 - III. Allegro Assai"
TITLE "Violin Concerto No. 1 In A Minor BWV 1041 - I. Allegro"
TITLE "Violin Concerto No. 1 In A Minor BWV 1041 - II. Andante"
TITLE "Violin Concerto No. 1 In A Minor BWV 1041 - III. Allegro Assai"
TITLE "Violin Concerto In D Minor (Double) BWV 1043 - I. Vivace"
TITLE "Violin Concerto In D Minor (Double) BWV 1043 - II. Largo"
TITLE "Violin Concerto In D Minor (Double) BWV 1043 - III. Allegro"
TITLE "Concerto For Violin & Oboe In C Minor BWV 1060 - I. Allegro"
TITLE "Concerto For Violin & Oboe In C Minor BWV 1060 - II. Adagio"
TITLE "Concerto For Violin & Oboe In C Minor BWV 1060 - III. Allegro"